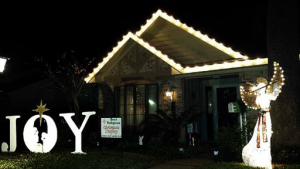 The Civic Committee would like to thank all of those involved in coordinating, setting up, cooking, and tearing down this year’s Annual Cajun Christmas Party. Neighbors, new and old, enjoyed a delicious gumbo feast prepared by Tom Demary, and they also enjoyed appetizers/desserts prepared by the great residents of Forest West. Each child was presented a book and candy bag. We look forward to planning more great events for the spring and summer. The next civic committee meeting will be held January 26th, 7:00pm, at the Forest West Community Center. Now is a good time to get to work on our vegetable gardens. The ideal vegetable garden area needs full to nearly full sunlight and has well-drained, fertile soil. The garden should have a water faucet close but not be near shrubs or trees that compete for water and nutrients. If your soil is heavy clay like most in Houston are, adding organic matter, sand or gypsum will help it. To improve clay soil, add about 1 to 2 inches of good sand and 2 to 3 inches of compost. Be sure to mix and thoroughly blend the elements and soil together. If your soil is heavy clay, also add gypsum at the rate of 6 to 8 pounds per 100 square feet. Now that your soil is ready, you need to decide what vegetables to grow. It is important to select the right variety of each vegetable. If you plant the wrong variety for our area you may not get much of a crop, no matter how much care you give the plants. Varieties of vegetables that have been reported to grow well in Houston are Bonanza and Gypsy broccoli, Snow Crown, Majestic and violet Queen cauliflower, Merit and Silver Queen corn, Purple Rain eggplant, 1015 bulbtype onions, Big Bertha or Blushing Beauty peppers, Better Boy, Beefmaster and Early Girl Tomatoes and Cherry Belle or Champion radishes-all of which will work in a smaller garden. Head lettuces don’t do as well here so select a good leaf lettuce such as Butter Crunch Bibb or Little Caesar Romaine if you want lettuce in your garden. It’s also a good idea to use a fertilizer such as 10-20-10 or 12-24-12 applied at 1 to 2 pounds per 100 square feet for your garden and try to keep your garden free of weeds, insects and disease. Thin the young plants to deter excessive competition for nutrients. Water deeply as needed. Keep an eye on your garden to try to stay ahead of any problems and enjoy your vegetables! The winners of the Annual Forest West Garden Club Christmas Display contest were Ruby Schell on Autumn Forest, Pam and David Ojeman, on Greenmont, and Renè and Monica Felix on Golden Forest. Photos could not fully capture the beauty of these displays. Many more residents captured the spirit of friendly competition this year, and we look forward to the upcoming year of competition. 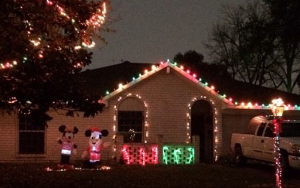 – A few residents have already begun planning their displays for 2016! The Garden Club felt that a special award should be given this year to the “best block.” This new award goes out to our neighbors on the 5900 and 6000 block of Spruce Forest! 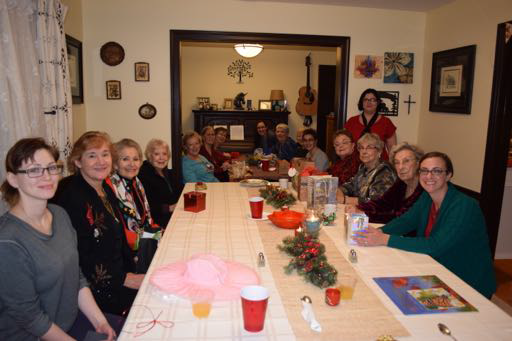 Forest West Garden Club members gather for their annual holiday party. Now is the time to plant fruit trees. Urban Harvest will host its 16th Annual Fruit Tree Sale on Saturday, January 16th. Over one hundred varieties and thousands of fruit trees, which are acclimated to Houston’s climate and soil, will be offered. The sale will take place at Rice University’s Greenbriar Lot, 5600 Greenbriar Drive, Houston TX 77005. Garden Club advises that you arrive early to get the best selection – the sale is from 9:00 am – 1:00 pm (or until everything sells out). Pruning, Deadheading, and Seeds – Tuesday, February 9th at 7pm. Wine Goblet Art – Tuesday, March 8th at 7pm. Thrillers, Fillers, and Spillers – Tuesday, April 12th at 7pm. A new year has begun, and we hope that everyone had a joyous holiday season. Our annual open FWCIA Board meeting and election of board members and officers will be Tuesday, February 2nd 7:00pm, at Advent Lutheran Church, which is located at 5820 Pinemont Drive. Please plan on attending. If a representative from your household cannot attend the meeting to place your vote, please fill and return the proxy before the specified deadline. Proxies will be coming in the mail from Beacon Residential Management. As always, it is important that we have a quorum at the annual meeting. The yearly assessments are now due. Please pay before Feb 1st to avoid late fees. 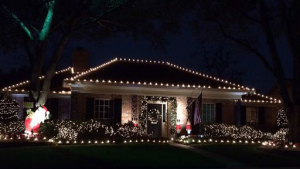 If you cannot make payment in full, please contact Brent Miller at 713-466-1204 to arrange a payment plan.